SINGAPORE - Every home cook would have faced the problem of leftover ingredients after cooking. The leftovers may either end up getting tossed out or left forgotten - and sometimes rotten - in the fridge. For The Straits Times' eco special, I was challenged to whip up a dish using leftovers. It got me to rethink food waste and made my mother happy at the same time. You see, my compulsive buying of ingredients has often sparked more rage than joy in my mother, who has the unenviable job of clearing out expired food and condiments left over from my culinary experiments. While home composting is an obvious solution for those who have plants, it can be fussy and messy, and half measures will attract pests. A more practical approach for home cooks is to shop responsibly and minimise waste. A little planning can prevent buying more of what you need or already have. The first step is to check what is in your kitchen, and where possible, use what you have. Some ingredients like peppercorns can be kept for extended periods. Dry-roasting old peppercorns in a pan awakens their flavours. The same applies to other spices such as cinnamon and cloves. If you have cooked food leftovers, see if they can be used for a stew or stock. Every festive season, I look forward to making a spicy tangy chye buay (chye buay refers to leftovers in Hokkien) with Chinese mustard greens using leftover roasted meats and bones. Also, challenge yourself to season your dishes with ingredients that you already have in your kitchen, such as light soya sauce. I find that it helps to shop at the wet market when it comes to ingredients such as shallots, onion, garlic, ginger and chillies. Vegetable stalls and provision shops allow you to buy these in the quantities you want, unlike supermarkets which usually sell these items in fixed amounts. How often have you binned scraps such as coriander roots and garlic skins? Well, I saved these odds and ends and threw them into the stock pot, together with chicken bones, for Khao Tom, a Thai rice porridge dish. The coriander roots and garlic skins, usually seen as waste, added incredible flavour to the stock. In Thai cooking, coriander roots are an important ingredient. My friend's wife, who is Thai, values them to the point of freezing them for future use. She has a tip for cleaning the coriander roots - soak them in a baking soda solution and rub with your fingers to help remove the dirt. Scraping with a paring knife gets them extra clean. And here's a tip for those who like to make their own chicken stock: Buy the birds from the wet market. Packed deboned meat from the supermarket will obviously not come with the bones. But wet market stallholders will bag the bones if you ask. Use them for boiling chicken stock - this helps minimise waste and saves you money on store-bought stock. This is how I make the chicken stock for the Khao Tom. The broth, with the punchy flavour from the coriander roots and garlic skin, goes a long way in transforming leftover rice into a delicious one-dish meal. Try it out yourself. And before you toss out those food scraps, take a moment to think about what tasty fare you can whip up with just a little effort and imagination. 1. In a bowl, mix a teaspoon of baking soda and 1 litre of water. Soak the coriander roots for five minutes. 2. Discard the mixture. Clean and rinse the coriander roots. Set aside. 3. Bring 1 litre of water to a boil. Add the chicken bones and boil for three minutes until there is no more visible blood. Turn off the heat. Drain the water and rinse the chicken bones. 4. Bring the remaining 3 litres of water to a boil in a clean pot. Add three coriander roots, chicken bones and garlic skins. Cover and boil over medium heat for 1 hour and 15 minutes. 5. Turn the heat off, strain and reserve the chicken stock. 6. Chop up the remaining two coriander roots. 7. Using a mortar and pestle, crush the white peppercorns, garlic, chopped coriander roots and fresh coriander. Pound into a paste and set aside. 8. Place the minced pork in a bowl. Add light soya sauce, 1 tablespoon of fish sauce and cornflour. Mix well. 9. Add the coriander mixture and mix well. Place in the fridge to marinate for half an hour. 10. 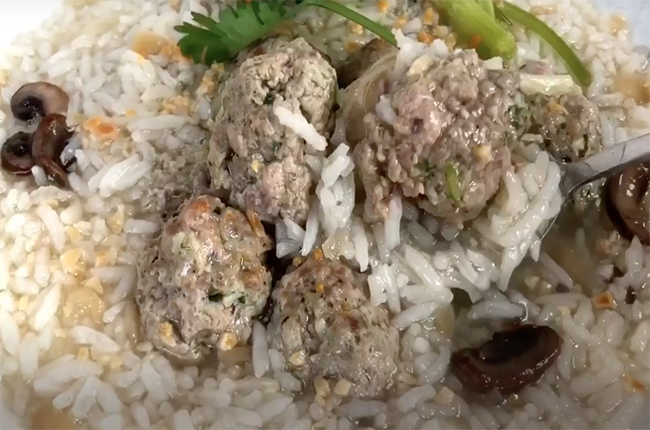 Shape the minced pork into balls of 25g each. 11. Bring the chicken stock to a boil. Add the pork balls and boil for a minute. 12. Add the brown button mushrooms and boil for one minute. 13. Add the cooked rice into the soup. Bring to a boil. 14. Add the preserved radish. Season with the remaining 1 tablespoon of fish sauce. Continue cooking until the pork balls float to the top. 15. Garnish with fried garlic and coriander leaves before serving.